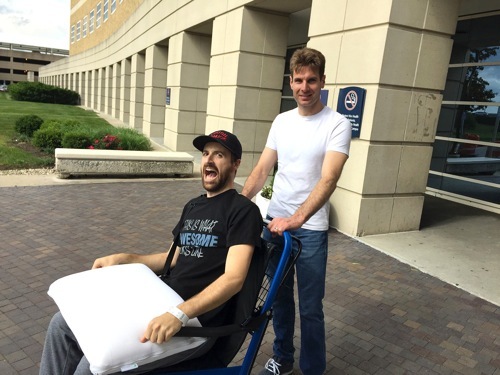 Reigning Verizon IndyCar Series champion Will Power pushes James Hinchcliffe’s wheelchair after Hinchcliffe’s release from IU Health Methodist Hospital on May 26, 2015 (photo courtesy of INDYCAR). INDIANAPOLIS (May 27, 2015) — Verizon IndyCar Series driver James Hinchcliffe was released from IU Health Methodist Hospital in Indianapolis on May 26, following surgery May 18 for an upper left thigh and pelvic injury suffered in a practice crash on the Indianapolis Motor Speedway oval. He will continue his recovery at his home and is expected to make a full recovery. Hinchcliffe, 28, of Toronto, has not been cleared by the INDYCAR medical staff to resume competition. Conor Daly will fill in for Hinchcliffe in the No. 5 Arrow/Lucas Oil Honda for Schmidt Peterson Motorsports this weekend in the Chevrolet Dual in Detroit presented by Quicken Loans doubleheader on the 2.3-mile Belle Isle street circuit. Hinchcliffe was injured when his car made right-side contact with the Turn 3 SAFER Barrier during a May 18 practice session for the 99th Indianapolis 500 Mile Race. He was transported by ground to IU Health Methodist Hospital, where he underwent surgery the same day. He was transferred May 20 from the Intensive Care Unit and, upon further evaluation, doctors determined no other procedures were necessary. Veteran Verizon IndyCar Series driver Ryan Briscoe drove the No. 5 entry to a 12th-place finish in the Indianapolis 500 on May 24. Follow Auto Racing Daily on Twitter @AutoRacingDaily or like Auto Racing Daily on Facebook (facebook.com/autorcngdaily).